Buckeye Valley senior Hannah Cowan dribbles around a defender in the Barons’ scrimmage against North Union earlier this month. BV opens the season at home against Linden McKinley in non-league action Tuesday night at 7:30 p.m. 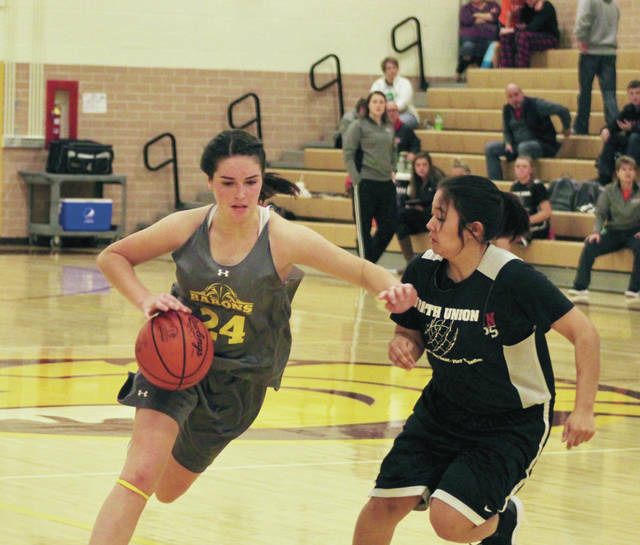 The Buckeye Valley girls basketball team went through some turnover following its first district final appearance in 25 years. The majority of the team’s scoring graduated in the spring, leaving the Barons with just three players (senior Hannah Cowan and juniors Danielle Grether and Reilly Taylor) that saw full-time action on the varsity level last season for a team that went 19-7 and 10-4 in the Mid-Ohio Athletic Conference. Add to that a coaching change for the second straight season as Mike Daniels takes over for Travis Stout, who made the move closer to home to Marion Pleasant. Daniels comes to BV from Olentangy, where he went 22-25 in two seasons. So, it may take some time for things to gel. Size is the one thing that hasn’t changed for the Barons. Five of the team’s nine players stand 5-foot-10 or taller, including Cowan (5-foot-11), who runs the point. Daniels is hoping somebody else can step in and play the point to free up Cowan to play off the ball. Daniels hopes that will give Cowan more opportunities to score. Scoring is a major concern. Cowan, Grether and Taylor are being asked to make the transition from secondary role players to primary scorers. Senior Cami Crawford and sophomores Anika Craft, Chelsea Edington and Mya Elliott all saw varsity time last season as well. Junior Maddy Fraker and sophomore Paige Garrett join the varsity roster this season. BV opens at home against Linden McKinley in non-league action Tuesday night at 7:30 p.m.